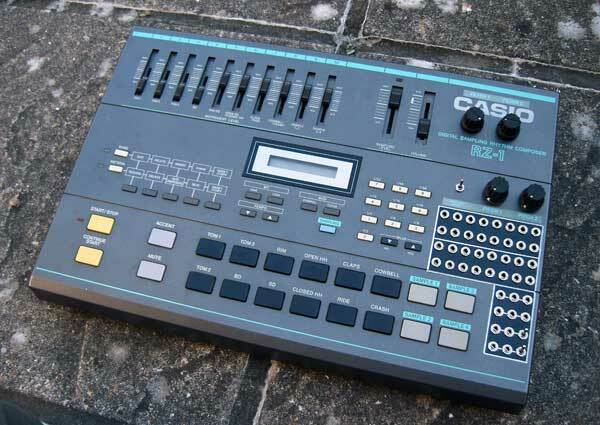 The Casio RZ-1 is a member of that rarest of breeds, the sampling drum machine. 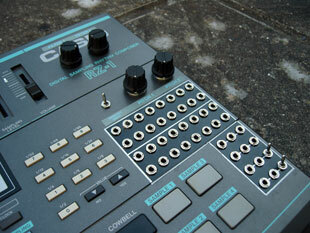 With a grand total of 12 sounds that seem to have been recorded from a passing bus, and space for four short 12 bit samples the RZ-1 was never going to be right at the top of anyone's kit lust list (and there's a phrase you don't hear everyday), but what really makes the RZ cool is its sheer crapness. The sounds punch and flap like someone battering you around the head with a plank of balsa wood, the timing has mechanical 'Daft Punk'ness' written all over it and the tiny amount of RAM assigned to each sample pad can be spliced together into one vast 1.5 second sample! Combine this with individual outputs and volume sliders for each sound, and the kind of weight you could uses to beat wales to death (and yes, we do mean the country) and you have a machine that passes through coolness and out the other side into the realm of uber-cool. 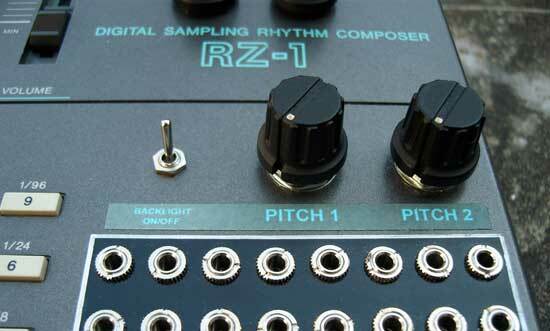 The RZ-1 mods consist of two main patchbay areas, one for the built in sounds and one for the sampled sounds. Each patching area consists of 16 patchbay sockets. General patchbay information can be found HERE. Connections made between sockets in the upper preset sounds area will cause all kinds of ring modulation, sound chopping, distortion, resequencing and general weirdness to be applied to the preset drum sounds. The sampled sounds are not affected. When the lower patching area is used the same kind of effects are applied to the sampled sounds and the preset sounds aren't affected. It is also possible to patch from the preset area to the sampled area to that the built in and the sampled sounds affect each other with bizarre splicing and re-triggering effects. Click on the demo's below for mp3's of what these mods can do. These demos were taken from the mono output of one RZ1. 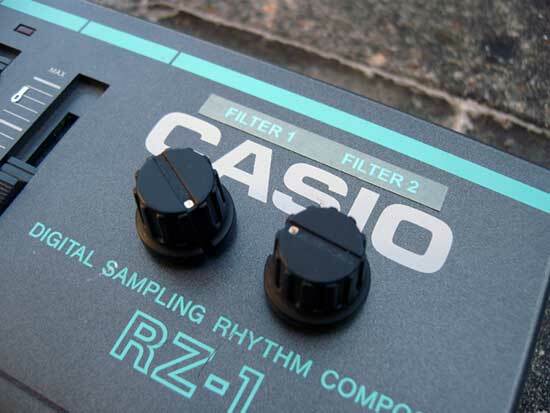 Another thrilling feature of the RZ-1 are the 'tone' knobs that act as a kind of low pass filter for the banks of samples, one knob per two samples. For some reason Casio in their infinite wisdom chose to implement these controls as two tiny knobs on the back of the machine. The main problem with this being both their inaccessibility and the fact that the pots tend to fall apart through over use. 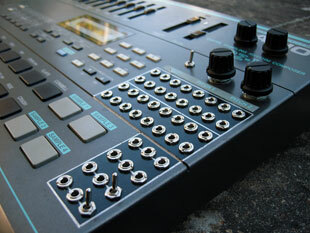 This mod brings the tone / filter controls out to knobs on the front panel giving far more accessible control. Demos of this mod in action can be heard on the mp3's above. This mod adds a pair of pitch controls above the main patchbay area. The first knob controls the pitch of the first eight onboard percussion sounds (bass drum, snare, toms, rim and hats), and the second knob controls the pitch of the remaining four onboard sounds (clap, ride, cowbell, crash) along with the four sampled sounds or sample banks. As with many modifications of this type you do start to experience a very slight background whine as you take the pitch down to the kind of low levels that make the drum sounds turn into a wall of gritty aliasing noise, but in use this is usually masked by the sounds. The whine is only really audible at pitch settings where the sounds stop having even a passing acquaintance with percussion, and by that point a slight whine is the least of your worries! It may actually come as a surprise to a lot of RZ1 owners that it does actually have a backlit screen. Well, its meant to have a backlit screen but at the time Casio seemed to have an astonishing talent for producing backlights that died in a couple of years. If you do still have a working backlight or your backlight is dead but theres an annoying whine on the main audio outputs, you may be experiencing a problem common to a lot of units of this era where signals from the backlight inverter are leaking onto the audio lines. This mod that you can see in the photo above next to the pitch knobs, simply adds a switch that disconnects the backlight inverter. Obviously if you have a working backlight this will turn the light on and off. If your backlight is dead then theres probably no point in installing a switch, so we usually just remove the inverter from the PCB instead. There is no easy replacement for the backlight that we have found. Unfortunatelyyou can't just use a new screen with an LED backlight as normal drop in replacements won't work. RZ-1 MODIFICATION DEAL: If you want all the mods installed on your RZ it costs £170. A saving of £10 on the the normal price. if you want your RZ1 modded get in touch using the CONTACT form.